Sea Map II – this is one of several recent paintings inspired by a sea voyage I took last year. Strange feeling to be out of sight of land. Using paint to mark out the endlessly moving terrain of waves and clouds — so interesting. This entry was posted in landscape, oil, Uncategorized and tagged Deb Anderson, ocean, oil painting, sea, sky, waves. Lost in a tangle of plants—chicory, queen anne’s lace, joe pye weed. Bristling structures of thistle. Delicate strands of bindweed. Tense pods of jewelweed, showy plumes of goldenrod. Dry hedgerow, lush forest understory, the fluid surface of water, triangular folds of fabric. In Robert Pirsig’s Zen and the Art of Motorcycle Maintenance a young writing student has nothing to say about the world, her country, or her town. Her instructor suggests she narrow her focus to one street or one building, and then to a single brick. With that narrowed focus she is suddenly free to describe and engage with her subject, and to express herself. Lost in transient, maybe irrelevant details, painting is a way of paying close attention—a meditation. The subjects become a mirror of the inner landscape. Mapping out my context within changing spaces. This entry was posted in oil, Uncategorized, waves and tagged Deb Anderson, exhibition, North Park University, sea, waves. This small wave painting is 6 inches square, lovely water and sky on a Lake Michigan Beach. I’ve been working in (and working on) the studio, but I’m hoping to paint outdoors again soon, especially with the weather so fine. So far improvements to the studio are limited to cleaning. I’d like to put up some art shelves and maybe rearrange furniture in there. Clear it out! I’m happy to have started posting on Instagram this week: photos, sketches, and pictures of paintings in progress. If you use Instagram find me at debrhapainting. I also listened to some interesting podcasts and videos recently. The artist Beck Lane shares many videos on youtube. Her three basic rules, if I’m remembering right: 1. There are no rules, 2. It doesn’t matter, and 3. Everything is fixable. Peas are planted, peach tree is blooming – happy spring!! This entry was posted in lake, landscape, Uncategorized and tagged Deb Anderson, Lake Michigan, landscape, oil painting, small painting, waves. Light Shift, Lake Michigan; two panels, each 12 by 24, oil on gessoed hardboard, (1 inch deep cradle); ©2015 Deb Anderson. 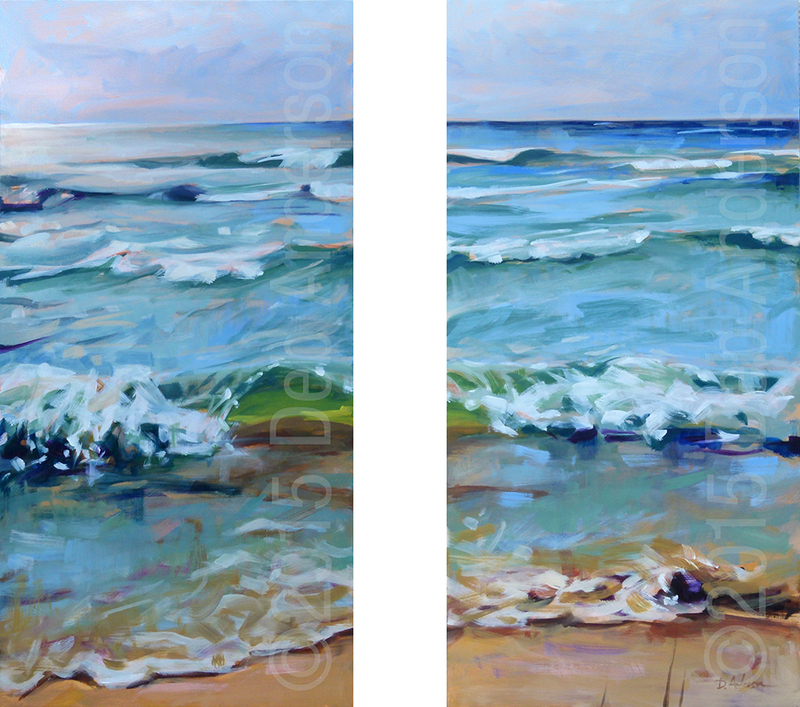 This pair of paintings was inspired by a beautiful evening on Lake Michigan at Bay de Noc. The slanting light had a silvery effect on the horizon. Working on these wave paintings is so soothing. I can almost hear the waves. I’ll be posting them to etsy soon, but first we’re heading out to the farmers market! This entry was posted in lake, oil and tagged beach, blue, Deb Anderson, Lake Michigan, oil painting, waves.